Custom Patio Doors & Glass Options | AMICA Windows and Doors Inc.
We’re dedicated to bringing beauty into your home, a mantra that led us to the charming and classic Capri patio door. It’s the industry’s most popular patio door, combining cutting-edge technology and manufacturing for outstanding reliability. The wood buck vinyl-clad Capri includes premium options such as interior and exterior finishes, high-performance security options, and unbeatable glazing. 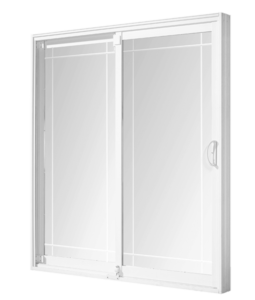 We proudly presents a door built with high-design and years of maintenance-free performance. Decorative Double “D” handles, colour-matched to the exterior and interior finish. Custom coloured doors use black handles. AMICA present the award-winning Bellvue patio door. It combines elegance and performance to enhance the look of your home. The Bellvue combines cutting-edge technology and manufacturing for outstanding reliability. We offer premium options such as interior and exterior finishes, high-performance security systems, and unbeatable glazing, so you can create the patio door that’s right for you. We welcome you to unyielding excellence and years of maintenance-free enjoyment.